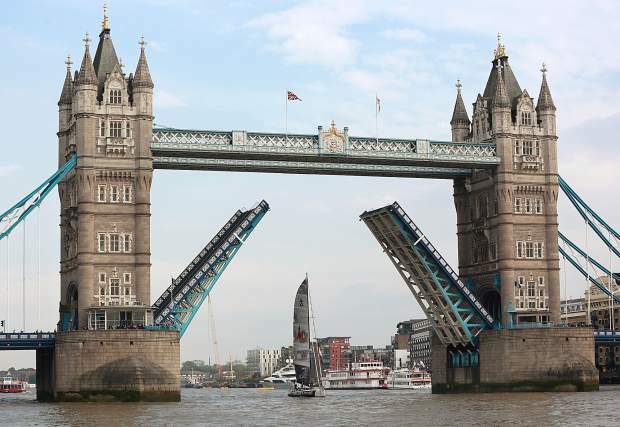 The Tower Bridge in London opens to allow Ricardo Diniz and the Taylor325 yacht to deliver their cargo to London town. In the world of wine marketing, no anniversary is too small to promote. It seems that every winery wants to tout a 10th anniversary of this release or a wine that is a “perfect match” for Father’s Day or Groundhog Day. And I get it. But the vast majority of the ideas are a stretch and some are downright cheesy. Ah, but not this one. This year, Taylor Fladgate, the famed port house with an extended history and reputation for quality, celebrated the — get this — 325th anniversary of their founding. To celebrate this milestone, they asked Portuguese single-handed, solo yachtsman Ricardo Diniz, the brand’s “sea ambassador,” to sail a cask of port from Taylor’s port cellars in Vila Nova de Gaia, Portugal, to London. His voyage replicates the first such transfer in the year 1692. Here in America, we were holding trials and hanging witches that year. Earlier in May, Diniz sailed a 60-foot yacht, christened appropriately as Taylor325, from the Portuguese coast to the mouth of the Thames, up the river, under the Tower Bridge, which was raised to allow passage, and into the very heart of London. There, he delivered his prize cargo, the port cask. It was in time for a special black tie dinner for members of press and trade and special friends of the brand that has been called “The Rolls Royce of port.” Now that’s how you mark an anniversary. Diniz, today, is in England preparing to sail Taylor325, by himself, from Plymouth, England, to Newport, R.I., in OSTAR 2017. The race will set sail on Monday. OSTAR, which stands for Original Single-handed Trans-Atlantic Race, is a prestigious and renowned contest that is held every four years since its origination in 1960. The crossing of the Atlantic will take approximately 21 days and this will be the first time a Portuguese yachtsman will compete in the race. Taylor Fladgate has also created a special bottling to mark the establishment of the brand and that first sailing. Monikered as the “Taylor Fladgate 325th Anniversary Reserve Tawny Port,” the wine comes in a squat, onion-shaped bottle that replicates one used in the 1600s. Taylor Fladgate winemaker David Guimaraen is the sixth generation of his family to be involved in the port business. For the anniversary bottling, he selected a range of wines that have been aging 10, 20, 30 and 40 years as Old Tawny lots. Of the world’s special wines, port is known as much for its storied history as it is its unique flavor profiles. In the mid-1600s, there was a thriving trading relationship between England and Portugal and there already existed a community of Brits and Scots living on the sunny coast of Portugal. Trade agreement between the two monarchies gave ex-patriots special privileges and preferential customs duties. Simultaneously, a rift developed between England and France, creating an opportunity for English/Portuguese wine merchants to corner the market in England. It was around this time that Job Bearsley, an English merchant, traveled to Portugal with an eye toward making his mark in the wine business. From his base in Vila Nova de Gaia, just south of Oporto, Bearsley founded the company that eventually became Taylor’s, or Taylor Fladgate, as the brand is known today here in the United States. And it was from there that the first cask was shipped to London. Let’s hope that the voyager Ricardo Diniz kept a solid ration of the celebratory Taylor Fladgate 325th Anniversary Reserve Tawny Port for his trans-Atlantic crossing. He deserves it.